HONG KONG, Oct. 18, 2018 /PRNewswire/ -- PerceptIn is proud to announce that DragonFly Sensor Module has been selected as Gold Prize Winner of Hong Kong Electronic Industries Association (HKEIA) Award, after competing with about 4000 exhibitors from 29 countries. The distinguished product is presented to the visitors at the Hong Kong Electronics Fair (Autumn Edition) and arouses great interest among audience. DragonFly Sensor Module, the product won the top honor for its excellent design and cutting-edge innovation, is designed for vehicles and robots to achieve self-driving in low-speed scenarios. The sensor module consists of four hardware-synced high-definition global-shutter cameras (a stereo pair in the front, and a stereo pair in the back), an IMU device, and a Jetson TX1 computing module. The key functions of the product are object detection, localization and real time video streaming. DragonFly Sensor Module is able to capture images with its stereo cameras, and estimate the width and depth of objects around the vehicle or robot. In addition, it provides real-time localization updates, including positions and orientations, using Visual Inertial Odometry (VIO) technologies. Dr. Liu Shaoshan, Founder and Chariman of PerceptIn, demonstrated the DragonFly Sensor Module and elaborated its core functions and application scenarios to HKEIA Judge Panel. He addressed, "As the forerunner providing autonomous driving technology, we are pleased that the cutting-edge innovative technology is recognized as a distinguished product for industries. We will strive for product excellence and provide more innovative, quality products for customers demanding safer, lower-cost, and higher-efficient autonomous driving technology for their robots and vehicles." Besides the DragonFly Sensor Module, PerceptIn also provides customized solutions targeted different application scenarios. For example, DragonFly Pod is equipped for corporate and university campuses and areas with limited traffic to transport employees and goods. Another solution named DragonFly Intelligent Advertising vehicle, which is applied as retail channel and advertising channel, is popular among visitors during the exhibition. PerceptIn is a world-class full-stack visual intelligence company building machines that see, interpret, learn and take action. The company's core technology, focused on visual intelligence, is finding its way onto myriad new devices in a broad range of areas, from IoT-grade robots to autonomous driving. With offices in Santa Clara, California and Shenzhen, China, PerceptIn serves more than 100 customers and works on providing hardware and software solutions for the robotization of the next generation of products. The Hong Kong Electronic Industries Association (HKEIA), together with the Hong Kong Trade Development Council (HKTDC), organizer of the Hong Kong Electronics Fair (Autumn Edition) and electronicAsia, are organizing the annual product competition for exhibitors at the above fairs held on 13-16 October 2018. 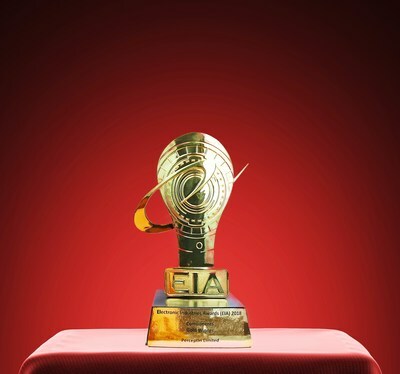 This year the award is renamed to Electronic Industries Award (EIA). Winners of the Award will be benefited from the promotion campaigns launched by the HKEIA and its supporters which include displaying the winning products at major international electronics trade fairs, advertising and publicity in relevant newspapers, magazines, websites and online platform. Hong Kong Electronics Fair (Autumn Edition) is organized by the Hong Kong Trade Development Council (HKTDC) and to be held at the Hong Kong Convention and Exhibition Centre in October every year. About 4000 leading research facilities and companies from all over the world display their latest technology ideas. The fair is organized into key thematic zones ranging from audio-visual products to navigation systems, and from home appliances to telecommunications products. The Tech Hall comprises of five important tech elements including 3D Printing, Robotics & Unmanned Tech, Smart Tech, Startup and Virtual Reality.